Learn how to manage the symptoms and stress of chronic illness through gentle coaching, mindfulness, guided meditations and easy to understand daily mind-body awareness practices. 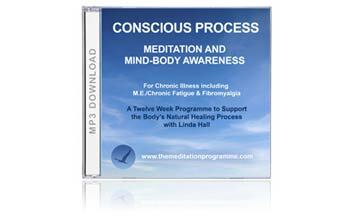 A Twelve Week Audio Programme to support the body’s natural healing process. If you suffer from fatigue, sensory overwhelm, ‘tired and wired’, busy mind, chronic tension, brain fog, anxiety, insomnia, or pain, this programme will teach you how to calm and re-balance your body and mind and help you to regain a sense of inner well-being. You’ll learn the role the Autonomic Nervous System plays in the management of symptoms, and will be taught self-soothing techniques to activate your body’s natural healing mechanisms. You’ll learn what is likely to increase your symptoms, what you can do to lower them, and how to put your body in the ‘optimum state for healing’. The programme will help you develop the emotional and psychological resources needed to manage your condition on a day-to-day basis, and will under-pin your long term recovery. Whatever your condition and level of mobility, the approach of this course supports you as an individual. By the end of the programme, you’ll have gained a set of solid self-help tools to support your health and well-being. You will also have learnt how to engage with yourself and life in a more mindful and compassionate way to help you feel more fulfilled and at ease with yourself. The programme takes into account the cognitive impairment and hypersensitivity that can often occur through illness. All information is therefore presented slowly, calmly and clearly and each of the twelve modules can be completed at your own pace. As an optional learning aide, we’ve included a PDF document of the content in each module for you to print and then read at your own pace, should you wish, to act as a reminder of what you’ve learnt and help you digest the information more easily. We’ve also provided a Frequently Asked Questions PDF document. 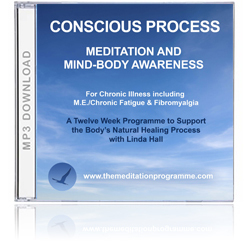 Meditation Teacher, Personal Development Coach and Psychology Practitioner Linda Hall, had M.E. Chronic Fatigue Syndrome, herself, for almost a decade. Since her recovery she has taught hundreds of patients at The Optimum Health Clinic, an award winning UK clinic specialising in M.E. Chronic Fatigue Syndrome and Fibromyalgia. DISCLAIMER: This programme does not make any claims to treat or clinically cure a specific condition. It is designed to be part of a holistic approach to health-care, including nutrition and other appropriate specialist support. The process of relaxation, and what’s necessary to be able to relax. "Conscious Process is a wonderful resource to manage stress and the symptoms of any chronic illness. The course is extremely well structured. The course is divided into modules, each of which contain three useful explanatory PDFs and three separate mp3 tracks with reflections, meditations/relaxation sessions. Each session is fairly short but very powerful. Being short, the sessions are excellent for those of us who are unwell with pain, illness or stress and have limited concentration."